On the request of many members, the Landgard Producers' Cooperative on Thursday evening awarded the Landgard Awards in the fruit & vegetables category again in 2019 as part of the Fruit Logistica. 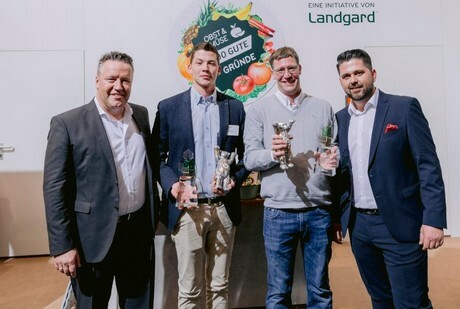 Armin Rehberg, CEO of Landgard eG, together with boxing legend Axel Schulz, presented the "Producer of the Year Fruits & Vegetables" Award to Matthias Draek from Straelen. Georg Hinzmann from Wachtberg-Fritzdorf was honored with the Young Talent Award. "The market is changing faster and faster and is demanding even more from us as a cooperative and from our member companies. Acting as strong partners, not just reacting - that is the maxim. That's why it's even more important to sometimes say "Thank you". This is precisely what we want to do with the Landgard Award," emphasized Armin Rehberg, CEO of Landgard eG at the award ceremony. "Strong companies with courage, ideas and innovations are the basis of success - for us as a producer cooperative and also for our trading partners. Only together can we meet the challenges of the future and inspire consumers to procure fresh fruit and vegetables from a shop." With the Landgard Award, the Producer Cooperative honors farmers who have made a special contribution to the future-oriented and customer-oriented stance of their businesses and the industry. The Landgard Young Talent Award honors young farmers as successors in an existing company, who have successfully set a course for the company and have thus positioned it in the market for the future or have recently launched it on the market. With awards totaling € 20,000, the Landgard Award is one of the industry's highest producer awards. In the Fruit & Vegetables Division, Matthias Draek is awarded the Landgard Award "Producer of the Year" in the "Fruit & Vegetables" category. Landgard honors his special commitment to the cooperative, as well as his flexibility and willingness to innovate as an entrepreneur and the future oriented stance of his own greenhouse operation. The professional roots of Matthias Draek, born in 1972, lie in his parental dairy farm with a production area of ​​over 100 hectares, where in 1991 they began growing tomatoes on 0.3 hectares. In addition to tomatoes, the trained grower was producing outdoor vegetables there as well by 2010. Since joining Neurather Gärtner GbR, Matthias Draek has also started the production of flavorful, fresh tomatoes for the regional market and the expansion of packaging services as an independent division. With great dedication and great flexibility, he and his partners have succeeded in establishing Neurather Gärtner as one of the leading fruit vegetable companies on the market, guaranteeing continuous availability of goods. In addition to all this, he continuously invests in the expansion and future viability of his family business in Straelen, most recently through the expansion by two hectares of greenhouse production. Quality and sustainability are top priorities in our own tomato production. Among other things, the grower trusts consistently in the use of beneficial insects for pollination. Also, Matthias Draek is always ready to take responsibility. Together with a company team, he also manages the tomato and pepper production of Vitarom Frischgemüse GmbH on an area of ​​11 hectares in Hemmingstedt, Schleswig-Holstein. Since 2018, Matthias Draek has also been a member of the Landgard Advisory Board on Fruits & Vegetables, intensively supporting the interests of the cooperative. 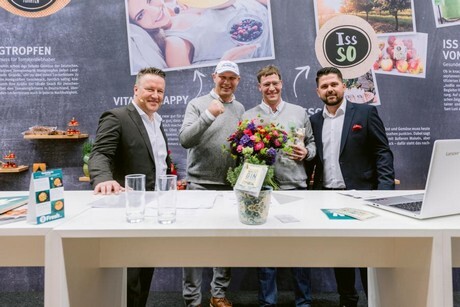 Armin Rehberg, CEO of Landgard eG, ex-boxing pro Axel Schulz, Matthias Draek, Grower of the Year - Fruit & Vegetables, and Labinot Elshani, chief representative of fruit and vegetables Landgard eG Sina Uhlenbrock. The Landgard Young Talent Prize in the Fruit & Vegetables Category goes to Georg Hinzmann. Born in 1994, Georg Hinzmann finished a fruit-growing apprenticeship, completing it with very good marks. Like his father, he is a master grower in the field of fruit-growing. Since last year, Georg Hinzmann is co-owner of the parental fruit grower firm, thus securing the continued existence of the family business for the next generation. With their production in Wachtberg-Fritzdorf in the Rhein-Sieg district of North Rhine-Westphalia, they attach particular importance to quality and sustainability, and it really distinguishes itself through the drive of the young co-owner, at a very high level. With up to 100 employees in the peak season, the family business grows pome fruit on 42 hectares, apples and pears in particular, as well as free-range strawberries on another six hectares. In addition to the daily work in-house, the young grower also takes the time to engage in the "core fruit group" for the interests of the industry and the producer cooperative. With this personal commitment, his high level of loyalty, close cooperation and not least his positive view on things, Georg Hinzmann is deemed a valued partner for Landgard, for the future of the cooperative.